Visit the website for an in-depth guide! Join the Discord to chat! Soulus is a mod about creating life and then exploiting it. It provides functionality for almost every aspect of mob farms, and late-game functionality for Beyond the Mob Farm™. Modpackers rejoice: Almost all functionality in the mod is also configurable or disableable! The main reason I made the mod is because I was sick of building giant mob-spawning boxes in skyblock modpacks (it was boring). However, even though the mod was made to fix that problem, that doesn't mean it's only usable for skyblock modpacks. In fact, the default mod configuration is for vanilla worlds. A normal playthrough of Soulus will have you digging up fossils in order to collect the "essence" of creatures past, then use that essence to spawn real creatures. When you're first starting out, you'll have to stay very close to your Summoner to spawn the creatures, and spawning will take ages. However, over time, as you progress through the mod, you’ll discover new technologies for increasing the speed and usability of your Summoners. Late-game Soulus is about using the creatures you spawn to automate crafting, and eventually compress their souls into the fuel for a kind of beacon which will allow your Summoners to function without your presence. Q: Will Soulus be back-ported to older versions? Q: No mobs are spawning! Help!! Q: I enabled mobs, but they aren't dropping anything! Help!!! Q: Will you add X? your website is super fancy, i like it. I just find it overkill. Nothing wrong with it though. this mod is laggy is there a way to fix it? fps lag not sure why even though my laptop is over powered gtx1070 quad core i7 4.5 ghz and 16 gb of ram. with 100 mods it shouldent lag right? 100 mods is a lot. Why do you think it's Soulus causing the lag? What Soulus stuff do you have in your world? How is the soul totem working ? I tried placing it beneath spawners, giving it another filled catalyst but the animation of the summoners stops when i'm going to far away and nothing spawns. You mentioned it being part of a multiblock in your wiki, does it need to be placed with something else ? Whoops, I forgot to show a picture of the structure on the readme! It's fixed now. Thanks for the ping! Btw an idea: Would be great if it could be activated / deactivated with a redstone signal provided at the base of the multiblock. That way you could use it as an offline chunkloader or deactivate it while you summon things yourself to save soul energy in it or even build a one time summon machine by combining that with the redstone signal from a summoner. And a way to automate (re)filling summoners with soulbooks would be great too. Like with a dropper or so. Another question: Is soul_catalyst_fuel_time in ticks it's running without upgrades and efficiency_upgrades_range > max a divisor for that ticks ? So if i set fuel_time to 24000 it's running a full minecraft day (20 minutes rl) without upgrades and upgrades max to 0.1 would increase that by factor 10 to 200 real minutes with 16 gears installed ? The only way to make a summoner that will last forever, by default, is to make a Midnight Jewel Summoner. This is a Summoner with no other upgrades except the Midnight Jewel. It won’t use up the book and it will be faster than max upgraded speed, but it won’t have the max range or spawn count. Otherwise, you can only extract the Soulbook by extracting everything and then inserting it in again, or switching the Soulbook out for a different one. You can automate this with fake player blocks such as automated users or autonomous activators. There will likely be a Soulus method of doing this eventually. There will not be support for piping them. I likely won’t be adding a way to disable the Soul Totem once it’s active, however you can remove one of the blocks of the structure and it will behave the same. A fair warning, tho: at some point I may make that dump the remaining Soul Catalyst. The point of not allowing it to be disableable is because it’s not supposed to feel like a machine, but rather like a “beast” that you’ve “tamed”. I guess I could add in a config option for that tho. As for the fuel time, I’m not sure. I’ll get back to you when I’m at my computer again. Is there a simple way to enable all mob spawning as normal? I posted on your GitHub a while back about looking for solutions to power spawners while they aren't within render distance, and you brought up the possibility of a soul totem. I've been keeping an eye out on updates and am looking forward to the next update. Keep up the good work, I'm planning to use this mod along with Deep Mob Learning to probably revamp mob farming for my 1.12.2 pack. Soul Totems should be coming next update, I'm working on them at the moment. I wanted to make them a very end-game item and didn't want to just make them very expensive, so for the last month or so I've been adding in a lot of other content to flesh out the middle game. Now that that's all done, there's a clear line to advance along that ends with the soul totem. The composer is the best example of the new middle-game content, as it's an autocrafting table that uses mobs as power, that can be upgraded to go incredibly fast. Most of the end-game soulus content uses this (including the fuel for the soul totem). Anyway, I'm sure you didn't comment to hear all that. I guess I'm just excited. Actually, as a pack dev, it's useful to hear a basic structure for any mods progression. Truth be told, most mod progression, even if it's expensive, rarely stays intact depending on the modpack maker's intentions, so I've always found documenting your progression or your intentions on how the mod is used can help pack devs figure out how to best integrate it. IF you have any other things I should watch out for, let me know! For example my pack is https://minecraft.curseforge.com/projects/interaction and it takes heavy inspiration from GregTech oriented progression packs, I was eventually planning on Soul Totem fuel being a mix of IC2 UUM Matter and Pink Slime from Industrial Foregoing, so a player would need good butcher operation. The expensive fuel always incentivizes the player to probably upgrade the spawner as much as possible (mob count) to extend the efficiency of the fuel. Unfortunately, I will have to disable some aspects like the mob spawns and your spawner replacement as it doesn't fit the theme of the pack, but overall I really enjoy the idea of a 'build-a-spawner' mod that goes deeper than Soul Shards. 1. Collect fossils (or bones, from living creatures), and iron. 2. Create a summoner (soulbook, essence, etc). 4. Use ender creatures and nether creatures to get the resources required for a Composer. Power the Composer via your summoners. 5. Using "Endersteel Alchemy" recipes for the composer, create more composers. 6. Use the Composers to create Niobium, the late game Soulus metal. 7. Using Niobium and a Soul Catalyst, create a Soul Totem. 8. Automate your Soul Catalyst setup, to power your Soul Totems, to power your Summoners without you being in their presence. Typing that out makes me realise just how complex the progression is. I might need to nerf a couple recipes... hah. I'm moreso focusing on the vertical slice at the moment than the balance of everything, so a lot of the stuff might still be overpriced. I don't recommend actually using other machines in a Soulus mob farm. (Except for mob movement, at the moment). Soulus is meant to work as a standalone mod, but also work along-side others, but having things which are easier than the "soulus way" will always lead the players to use the non-soulus way. The Soulus way to kill mobs is with the Skewer. This allows you to fill up blood crystals automatically. It also can be upgraded to tether ender creatures, to have increased damage, to poison creatures, and has a very expensive player upgrade (the previously mentioned soul catalyst). In the current modded ecosystem, there ends up being little to no progression, because everything is cheap and costs similar stuff. Instead of progression and difficulty being provided via new things and experiences, it's provided via new items that have little to no uses or flair. For me, that makes me tired of modded. If I can advance through most of vanilla and then can do everything in every mod, it makes me want to do nothing. This is the reason why most of the progression in Soulus works the way it does: it's meant to be tiered in a way that works alongside your vanilla progression. In this way, the mod is great for locking other mods behind its progression, but probably worse for locking parts of itself behind other mods. 1. Endersteel. Requires iron and ender dust, which can only be collected from glowing fossils in the world, or bone drops from ender creatures. If they need a constant source of it, it basically requires them to make an ender-creature summoner. 2. Dark Endersteel. Requires ash as well as the previous ingredients, which comes from using nether bonemeal (from nether bone chunks) on plants. This makes it required to have gone to the nether. Still not required to make a summoner, but would be highly beneficial. 3. Niobium. Requires a Composer to craft, which means a lot of endersteel (and dark endersteel). Since the Composer uses mobs as power, also requires a summoner. Once you get the first bit of Niobium, it's much easier to get, using Endersteel Alchemy. 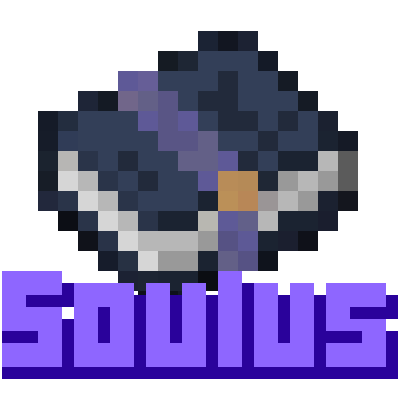 Just a ping to let you know that I've just released the Soul Totem update of Soulus. Let me know if you have any questions or issues! I'll be on vacation for the next two days, so I won't be able to patch, but I'll still be able to respond.